Highly conductive aluminum fins at the base of this quick boil kettle increase the heating surface area and promote better heat transfer to boil water faster than a traditional kettle can—at around seven minutes. This award-winning design saves you time and uses energy from a gas stove more efficiently. Dimensions: 10" x 8" x 8"
Heats up fasssst!! NO drips when pouring water out of spout!!! Just the right weight for us 'ol'folks to handle!! Solid construction--lookingstruction--looking for many fears of service!! It's beautiful and it WORKS! The quick-boil kettle and pot from Turbo Pot save you time and gas stove energy by doing the boiling job super fast—like, 30-50% faster than usual—thanks to a unique design that was tested (and is now used) in restaurants. The base of the kettle and pot are where all the quick-boiling action comes from. Highly conductive aluminum fins increase the heating surface area throughout the base of both and better absorb heat from a gas stove burner. 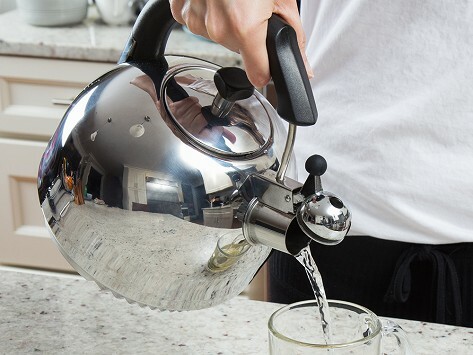 This gets water to a boil much faster than a traditional flat-bottomed kettle and pan—the kettle clocks in at around seven minutes—reducing heat-up time and lost energy. The team at Turbo Pot turned to restaurants to test out this award-winning design, who then added the kettle and pot to their kitchens. Now you can enjoy the same quick-boiling tools as the pros.